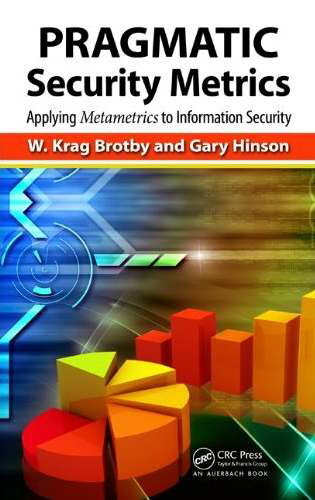 Whereas other authors are strong on the number theory behind metrics and measurement, PRAGMATIC Security Metrics is a reader-friendly guide for hard-working security practitioners. Without totally ignoring the underlying complexities, the book explains and interprets security metrics straightforwardly, adding a unique new ingredient to the mix: the PRAGMATIC method. Conclusions including a set of take-home messages - things to put into practice immediately. At face value, the PRAGMATIC method is just a way to score security metrics, but there’s much more to it than that. Think about it: how does your organization determine which security metrics are worth using? If you pick up a suggestion for a new metric from a book, a friend or a flash of inspiration, how do you assess its merits? The usual approach is entirely informal and subjective. Scoring and assessing the metric in a structured way forces you to think it through, in detail. What about the recipients or audiences for your metrics: do you deliver the security metrics you feel are important, or do you make the effort to find out what they want - and if so, how do you frame that discussion? What do you do to make them set aside the time to work out and explain their needs? The PRAGMATIC method is straightforward, cheap and easy to apply, meaning that busy security managers can get up and running in a matter of hours. Metrics are used not only to track and report performance but to identify problem areas and opportunities, and so drive security improvements. With a focus on using measurement data in support of management decisions, the book takes the discussion up a level by elaborating on the design of an information security measurement system with obvious application in support of an information security management system as described by ISO/IEC 27001. As soon as you appreciate the power of the PRAGMATIC method, you’ll be itching to put it into practice, especially if you, your colleagues and managers are presently struggling with security metrics. Aside from the P.R.A.G.M.A.T.I.C. mnemonic representing nine criteria for assessing and scoring metrics, the approach is pragmatic in the ordinary everyday sense of the word. You certainly don’t need a doctorate in statistics to make use of this book! Practical tips are scattered liberally throughout, with further information and references in the footnotes. We separated them out from the main text to encourage you to read quickly through the book at first to understand the overall approach, then go back to explore particular aspects in more detail as you apply the learning. It is an introductory guide/overview and an implementation guide/training manual, all rolled into one.